With a stay at Y2 Residence Hotel, you'll be centrally located in Makati, a 5-minute walk from Makati Museum and 14 minutes by foot from Power Plant Mall. This apartment is 1.1 mi (1.7 km) from Makati Stock Exchange and 1.4 mi (2.3 km) from Ayala Center. 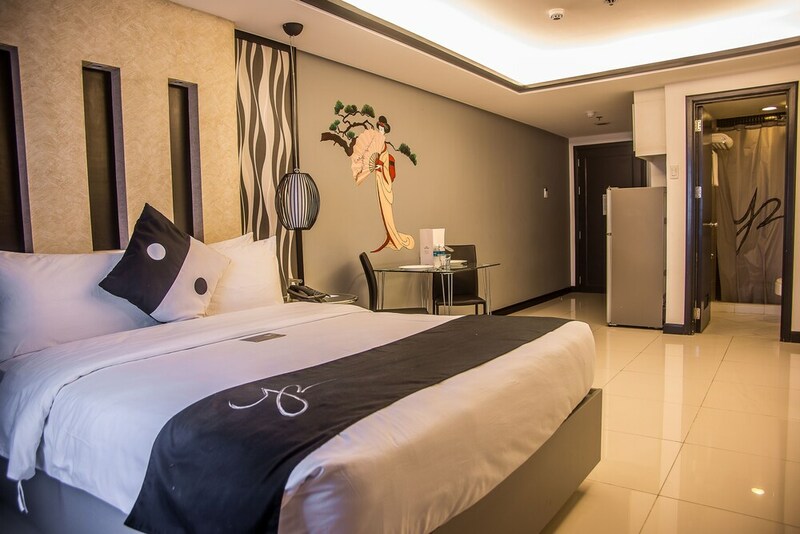 Make yourself at home in one of the 169 individually decorated guestrooms, featuring kitchens with full-sized refrigerators/freezers and microwaves. 42-inch LED televisions with satellite programming provide entertainment, while complimentary wireless Internet access keeps you connected. Conveniences include safes and complimentary newspapers, and housekeeping is provided daily. Enjoy recreational amenities such as an outdoor pool and a fitness center. Additional features at this apartment include complimentary wireless Internet access and concierge services. Getting to nearby attractions is a breeze with the area shuttle (surcharge). Enjoy a meal at Pink Panda or snacks in the coffee shop/café. The apartment also offers room service (during limited hours). Buffet breakfasts are available daily from 6:30 AM to 10 AM for a fee. Featured amenities include limo/town car service, dry cleaning/laundry services, and a 24-hour front desk. Event facilities at this apartment consist of a conference center and a meeting room. For a surcharge, guests may use a roundtrip airport shuttle (available 24 hours) and a ferry terminal shuttle. In addition to an outdoor pool, Y2 Residence Hotel provides a fitness center and a children's pool. Dining options at the apartment include a restaurant and a coffee shop/café. Business-related amenities at this 3.5-star property consist of limo/town car service and a meeting room. Public areas are equipped with complimentary wireless Internet access. This Makati apartment also offers a rooftop terrace, spa services, and concierge services. For a surcharge, the property provides a roundtrip airport shuttle (available 24 hours) and a theme park shuttle. Y2 Residence Hotel has designated areas for smoking. Pink Panda - This restaurant specializes in Asian cuisine. This property offers transfers from the ferry terminal (surcharges may apply). Guests must contact the property with arrival details 24 hours prior to arrival, using the contact information on the booking confirmation. Only registered guests are allowed in the guestrooms. Some facilities may have restricted access. Guests can contact the property for details using the contact information on the booking confirmation. No pets and no service animals are allowed at this property.